There’s a crazy rumor about who could play Catwoman in Gotham City Sirens. Laura Dern teases her mysterious Star Wars: The Last Jedi character, Admiral Holdo. Don’t expect Kevin Smith to direct Arrow any time soon. Plus, new clips from Star Wars Rebels and Karl Urban hopes for a Thor movie with a female lead. Spoiler Now! Josh Brolin told Collider the X-Force movie could begin filming “sometime next year”. I think [X-Force films] sometime next year or soon thereafter. It depends. It all depends. It depends on how Deadpool 2 does, but I don’t think that’s a make or break kind of deal. Drew Goddard is already involved in it. He’s into it now. I know he and Ryan were meeting. I’ve met him once, and so this is all kind of going ahead. How it goes ahead, I know that they’re preparing, and I know that it’s something that I’m set to do. When it happens they’re going to put it as fast as they can. I think Drew Goddard is doing his movie right now and then once he’s kind of wrapped up with that and this movie comes out I think we’ll be ready to start the other one. In an interview with Entertainment Weekly, Robert Englund stated he’s “too old” to play Freddy Krueger again. I’m too old to do another Freddy now. If I do a fight scene now it’s got to be real minimal because I can’t snap my head for eight different takes and different angles. My spine gets sore. I can still be mean and scary, but I’m mostly relegated now to sort of Van Helsing roles, old doctors and s––. So it’s fun that the last moment of me ever playing Freddy is a wink to the audience. Laura Dern shared a new still of her character, Vice Admiral Holdo, on Ellen. Watch the relevant portion of the interview, below. Karl Urban champions a female Thor in this interview with Monkeys Fighting Robots. Coming Soon has a new poster and banner. Captain Cold gets a new, fluffier costume in this set photo from the massive CW crossover. 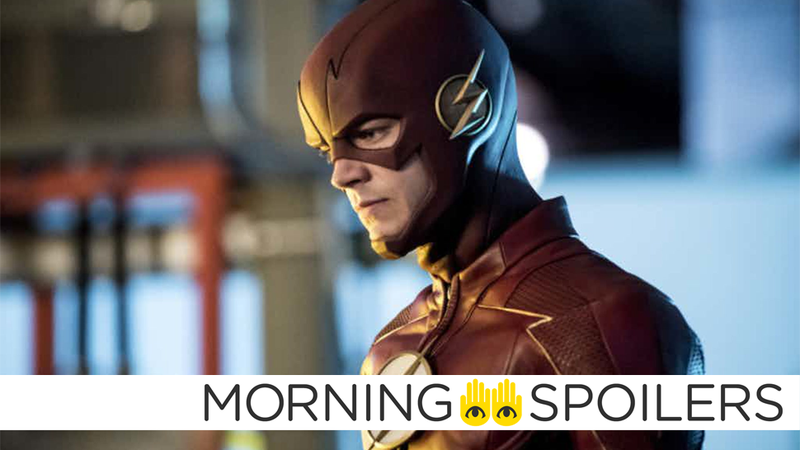 Meanwhile, even more set pictures from filming have seemingly revealed that the evil Flash of Earth-X appearing in the crossover won’t be a double of Barry Allen... but is instead another version of Harrison Wells, as Tom Cavanagh has been spotted running around in the Reverse-Flash-esque suit. Alfonso Cuarón is teaming up with Casey Affleck for a new horror series that will be pitched to multiple networks and streaming platforms. While details are under wraps, Deadline reports the show will explore the origins of a burgeoning cult. Slade (Manu Bennett) returns and asks Oliver (Stephen Amell) for help in tracking down his son. When they learn Joe (guest star William Franklyn-Miller) has been taken hostage by mercenaries, their mission to save him gets complicated by a terrible revelation that could shatter Slade’s hopes of reunion forever. Meanwhile, Vigilante reappears in Star City. Meanwhile, TV Line has new pictures from next week’s episode, “Next of Kin”. More at the link. In further Arrow news, Kevin Smith told Screen Rant he doesn’t think Marc Guggenheim will ever let him direct an episode of Arrow. You and me both, and I’ve been saying it for years, but Arrow, they don’t care. [laughs] I guess it’s Marc Guggenheim, he doesn’t care. I talked to him once after a panel at the Paley Center, I was the moderator for the Paley Center CW panel at the Hollywood and Highland complex. And so afterwards, I was talking to Marc, and I was like, “hey man, fans keep saying they want me to direct an episode of [Arrow], I would love that, I wrote Green Arrow.” He knows that. And he goes, “yeah, you know, Arrow is very dark. Legends [of Tomorrow] would be good for you.” [laughs] So, I don’t think they’re ever gonna let me near Arrow, which is totally fine. I love doing Flash and Supergirl, and even though they say I direct, I’ll be honest with you—I’ve said this a zillion times, but I always wanna make it clear because maybe there’s kids in the audience going, “oh, I’ll never be able to direct Supergirl”—yes you can. Oh my God—I don’t know if you will be able to, but you can do it, it’s insanely simple. A visit to the foster home carries deadly consequences, as Marcus and Father Tomas attempt to draw the demon out of hiding. Rose finds herself the target of the demon’s wrath. And no one suspects that a new danger may be lurking in the woods, waiting for its moment to strike. Meanwhile, Father Bennett and Mouse take the fight directly to the conspiracy as they attempt to hunt down an old adversary. When Alice (Madchen Amick) publishes a fiery piece in the Riverdale Register blasting the Southside, Jughead (Cole Sprouse) is forced to take matters into his own hands to try and keep the peace. Betty (Lili Reinhart) turns to Archie (KJ Apa) for help after receiving an ultimatum that could potentially destroy some of her closest relationships. With their SoDale open house fast approaching, Hiram (Mark Consuelos) and Hermoine (Marisol Nichols) enlist the help of an unlikely ally to get some potential investors on board. Finally, Veronica (Camila Mendes) welcomes her old friend Nick St. Clair (guest star Graham Phillips) to Riverdale, but his plans for a wild night with the gang quickly takes an unexpected turn. While working on a case involving the ghost of a demented doctor, Sam (Jared Padalecki) and Dean (Jensen Ackles) get assistance from an unexpected source – Billie (guest star Lisa Berry). Castiel (Misha Collins) finds his way back to the Winchesters. The Orville is called to mediate a peace treaty between two warring cultures, but tensions run even higher between Ed and Kelly when a familiar face boards the ship. Meanwhile Yaphit declares his love for Dr. Finn with surprising results. Grundy and Nygma become main attractions at Cherry’s Place in The Narrows. Penguin wants revenge when he hears Nygma is mocking him on stage and enlists The Sirens for help. Meanwhile, Gordon is offered the position of GCPD Captain, putting him at odds with Bullock. Finally, Saw Gerrera returns to debate the rules of engagement in the latest clip.